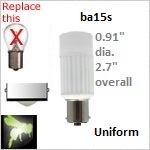 Single Bayonet Uniform light spread LED replacement bulb. Uniform light spread for LEDs with ba15s socket type and tower style construction. This LED is able to function on an input of 10-30 volts DC. Bee Green LED bulbs utilize constant-current topology. They are EMI free (no electromagnetic interference) and have an 80 CRI value to provide excellent light color.